Are you a good driver? 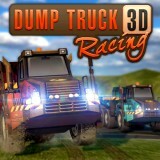 Then just try to do everything to drive your huge vehicle and come to the finish first. Do you think that it is so easy? Well, then just try it right now. Use the arrow keys to move and have so much fun here.